Two things that generally don’t go well together. Well, unless you want children stuck to the wall and a big messy pile of paper scrunched up in a corner somewhere. 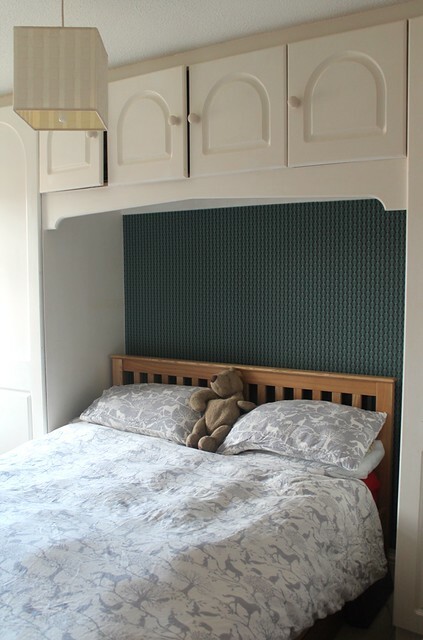 But I kind of liked the idea of brightening up our room (step 1 in the grand plan of room refurbishment), and that involved putting wallpaper in the wall area behind out bed. So somehow, I was going to have to combine the kids and the wallpaper and hope for the best. Superfresco Easy is very clever, because it takes a lot of the likely error out of the whole wallpapering process. Rather than having to paste the paper, you can apply paste directly to the wall – eradicating the need to wave long sheets of sticky paper around in a confined space. AND if you do get it wrong, or if you damage it (or a small child damages it for you with pens, or scissors, or artful shoeprints) it’s easy to take off and replace as well. 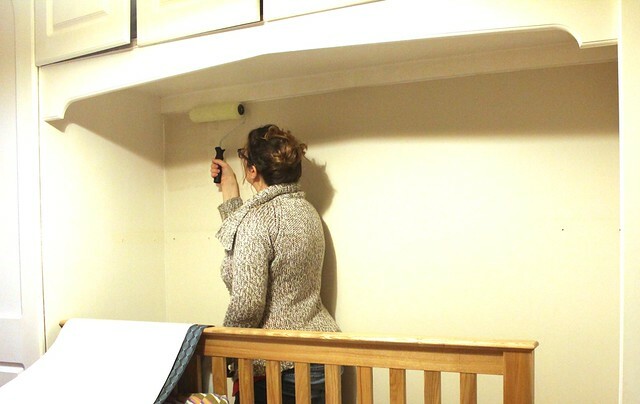 Remove shelves from the wall, smooth down screw holes and check for any cracks or bumps. Hold paper up to wall. Measure required drop for one length, and cut to size with additional 20mm for trimming. Cut enough lengths to cover the entire area, leaving additional 50mm to allow for pattern matching of the wallpaper. Mark out a plumb line 50cm across from beginning edge with a pencil, to ensure straight papering. Mix the paste (I used Solvite ‘paste the wall paste’ which came as part of a paste the wall kit including scissors, sponge, roller, tray, paste and trimming knife). Stand back and admire the beginning of the tranformation. Marvel at the fact it has stuck to the wall just like it said it would! Continue to add lengths of wallpaper, ensuring pattern is matched and edges are flush with each other. Use trimming knife to finish off and tidy up all top and bottom bits. Have ‘help’ from two small children back from the park and eager to use the giant wallpaper brush themselves. 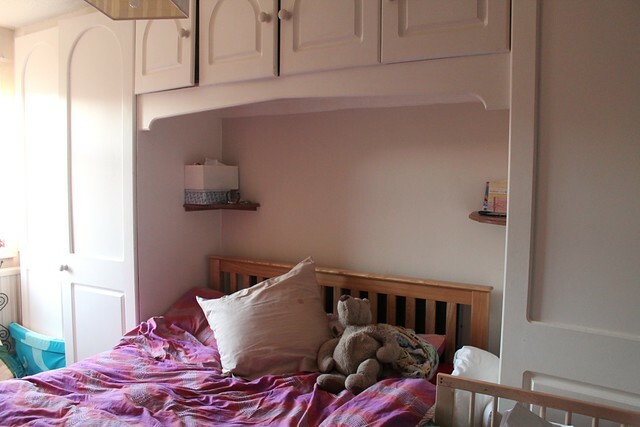 Witness tantrum following refusal to immediately cover their bedrooms in wallpaper too. 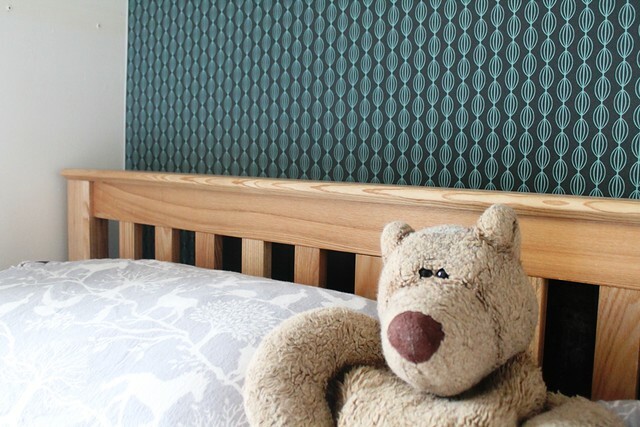 Placate them with the now-less-foolish-seeming suggestion that we can look at wallpapering their room next, once I have stood back and admired my handiwork. Stand back and admire handiwork. Not bad for an hour! I almost don’t believe it’s possible, but we now have a room which actually has a bit of character. 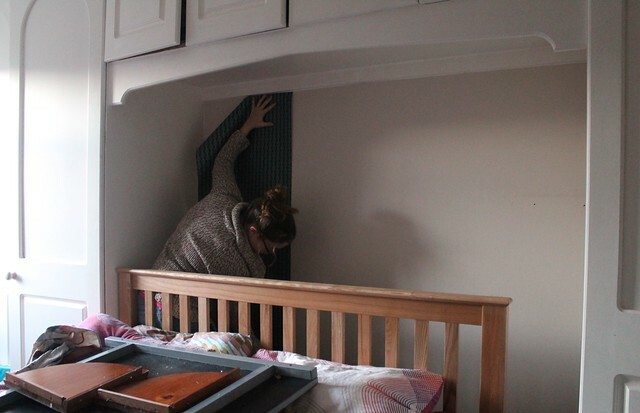 Four years of living in a magnolia box later, the journey to put our imprint on the house has begun – and having flown over the initial hurdle of ‘it’ll all go horribly wrong’ I’m feeling motivated to tackle all the other DIY on my list. Superfresco Easy looks great, is good quality and was far easier to hang than traditional pasting-table-at-the-ready paper; and because it’s so easy to put up and take off I wasn’t even [that] upset when OH promptly damaged it by waving the top of a desk about a bit rashly. I’ll just slap up another bit! 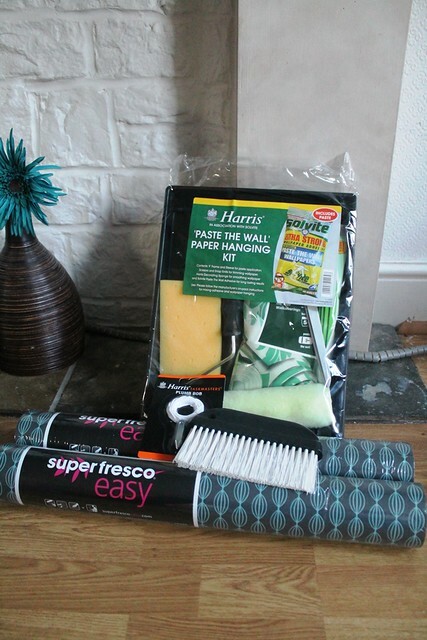 7 Responses to "DIY Diaries: Hanging wallpaper in an hour – Superfresco Easy"
That sounds fantastic! So simple! It looks great too! Kim Carberry recently posted…90:10 Hoodie – Review! Mel @mydaysni recently posted…Where Do All The Socks Go?